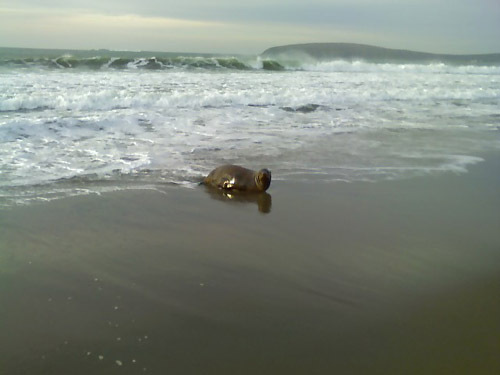 During our morning walk along Doran Beach, Ene and I were greeted by a friendly sea lion, who watched us from the surf before proceeding to briefly beach himself within yards of us as if to say hello. 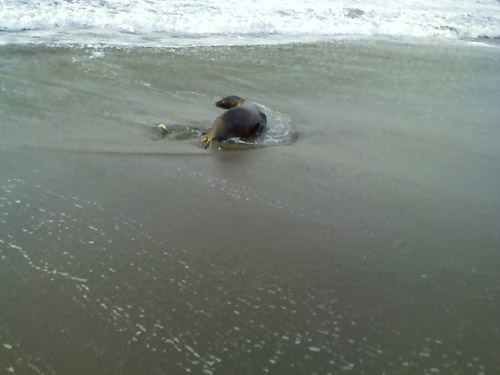 We’ve made hundreds of trips to this beach over the past few years, but have never seen this kind of behavior. Of course, this would be the one time I forgot to pack my camera- luckily, I had my trusty cell phone. As a corollary to the Murphy’s Law adage, anything that can go wrong will go wrong, I would add, be equally prepared for when things go right. As any crafts person can attest, there are occasions in the course of making that deliver uncanny coincidences, yet we most often do not prepare for success with the same ardent fervor that we do calamity. I’m not advocating unbridled risk-taking when it comes to safety or security, but suggest making room for the little successes that share equal probability with failure. Note: After some thought, my theory about why the sea lion would behave this way is that he thought we might have food for him, mistaking me for a Bodega Bay fisherman, whose boats the sea lions are known to trail. 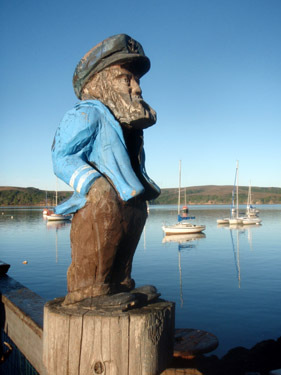 Bundled up in my yellow slicker and ‘Sitka sneakers’ for a chilly morning hike, with a two week beard, I kind of resemble those ‘old sea captain’ carvings (see below). I’d love to hear if anyone has had a similar encounter. Posted by Scott on January 11th, 2010, at 11:55 am, and filed under all, daily handwork, expedition, flora and fauna, visceral inquiry.